Learn how to make a super easy origami paper plane which flies a cool 'loop-de-loop'! This traditional origami aeroplane is fun for kids to make! We really like this origami plane, we have an aversion to paper planes that fly too far away, this one instead does a fun looping movement down to the ground, and would be fun to have a loopy competition to see whose travels the furthest away! This is such a simple origami model, with just 5 folds this origami plane is finished! We think that this origami plane could be taught to a 3-year-old, our 7-year-old daughter loves to make these for her friends at school. You'll need a sheet of square paper, we have made them with paper that's 15 x 15 cm. It will work with bigger paper as well. For another fun origami model, check out the origami jumping frog tutorial or the origami flapping bird tutorial! Start with your paper white side up if you have one. 1. Take the bottom corner of the paper and fold it in half up to the top corner and make a good precise crease. You should now have a triangle with the longest edge at the bottom. 2. Fold the top point, both layers, down to the middle and down a little bit further. You can estimate the center of the triangle. Or you could fold the triangle in half, right to left and make a small mark on the bottom edge, and use that a guide, but it doesn't have to be perfect! 3. Fold the left side over to the right. Making a vertical crease in the middle. 4. You can now fold the front flap back over to the left, using the little triangle at the bottom as a guide. Repeat this on the other side. Make them as even as possible. 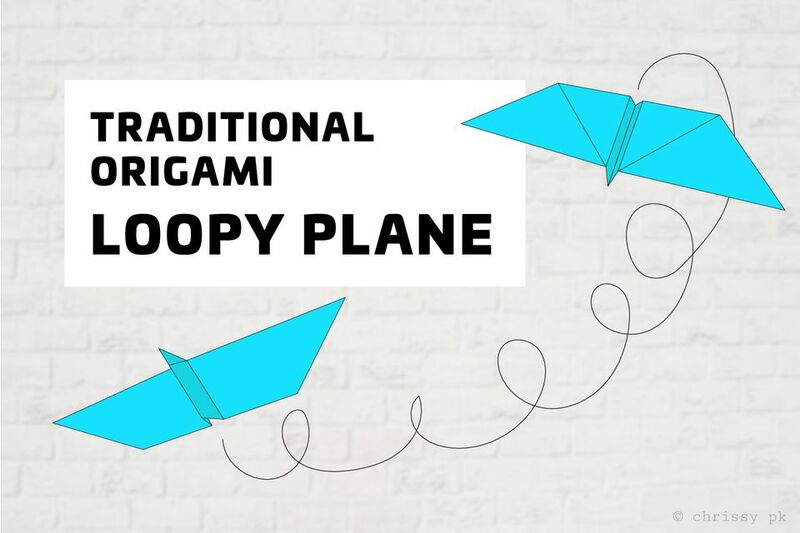 You should now have a cool little loopy origami paper plane, how to make it do loops? Hold the plane with the nose facing away from you, and place your index finger on top in the grove at the back of the plane, holding it up from underneath with your thumb and middle finger on each side of the groove. Lift the plane up in the air, and instead of throwing it forwards, push it down from your index finger and let it drop from your hand. Make sure the wings are as flat as possible and the groove not too spread out. For more tutorials and also video instructions, check out the channel called Paper Kawaii on YouTube. Learn How to Make a Cute Little Origami Finger Puppet!